Our staff are regularly achieving their personal goals and improving their skills. We at Reflex Panelbeaters also try to empower our staff by helping them with the practical experience they need to full-fill their courses. We are very loyal to our staff and in return, they stay with us for a very long time. 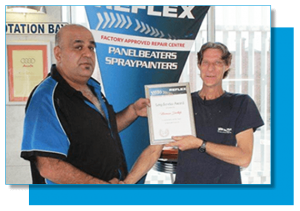 At Reflex Panelbeaters we give them this recognition for their hard work and extended service. Carlos Pereira (Left - General Manager) thanks and congratulates Happiness Dawethi (Right) for her 10 years of service. Carlos Pereira (Left - General Manager) thanks and congratulates Norman Deetlefs (Right - Parts Co-Ordinator and End Phase Quality Controller) for his 10 years of service. Reflex offers an opportunity to achieve qualifications through hard work and determination. Keegan was a young student of 17 years and fresh out of school, who always had a passion for this trade but was not qualified. Keegan was trained internally and after a number of dedicated years in this trade, Reflex Panelbeaters realised his potential and approached MERSETA. Keegan also successfully completed his trade test. Today Keegan is an officially qualified panelbeater and we celebrate his achievement. Richard was officially employed as a general worker and then showed an interest in the spraypainting department. He was trained in-house during the next couple of years. 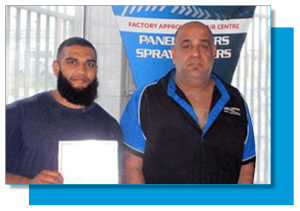 Reflex Panelbeaters then gave Richard the opportunity to become qualified as a spraypainter. Extensive consultations with MERSETA resulted in him completing his trade test. 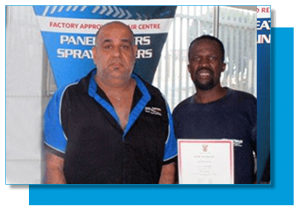 After years of experience, Richard successfully completed the above and we are proud to have him as an officially qualified spraypainter. 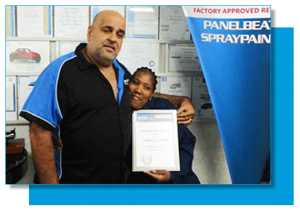 Reflex Panelbeaters and Spraypainters are one of South Africa's leading and accredited vehicle repairers, located in Wadeville, South of Johannesburg and have been in operation since 1989. We have been accredited by the Collision Repairer’s Association (CRA) for all aspects of our operations and have been awarded factory approvals from the major vehicle manufacturers in South Africa. Priding ourselves in quality repairs, we have established an excellent reputation with all insurance companies through our ability to deliver high-quality vehicle insurance accident repairs and panelbeating as well as excellent customer service.